The solution to the democracy problem - Soviet-Empire.com U.S.S.R. Insufficient democracy is one of the factors that led to the collapse of the Soviet Union. How can we make sure that this problem does not happen again? How can we prevent ossification, bureaucracy, usurpation, tyranny, oligarchy, etc? What is the simplest most effective way to implement democracy? 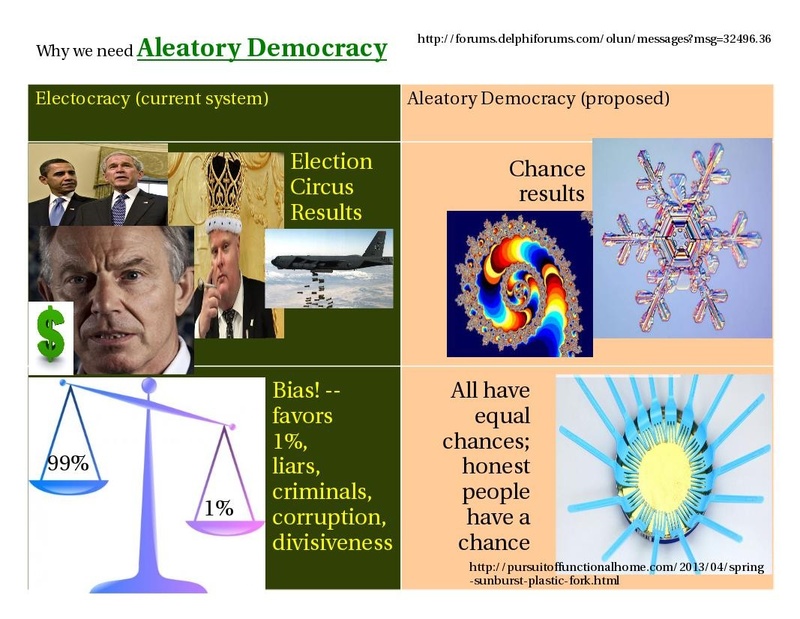 I've been exploring the "aleatory democracy" idea for years, getting nowhere, and then a month or so ago, I found the concept addressed at length by the British Guardian -- See David Van Reybrouck, "Why elections are bad for democracy", The Guardian (UK), 29 Jun 2016. In the current duopoly, no matter who we vote for, we get the same result, because the winner obeys the Establishment, over which we have no influence. Our vote has symbolic significance, however. If we vote for Trump, for example, we are saying that we oppose the Establishment and its boundless corruption. Democracy means "rule by the people". Our elections give us the exact opposite: rule by the Establishment, rule by the banks and the corporations, rule by those who own the big media, fund the candidates, and manipulate the voters. Elections are run by the oligarchic Establishment. Honest candidates are weeded out by the Establishment media, and the cost of the election leaves the remaining candidates financially dependent on the oligarchy. Two of the greatest political thinkers of all time, Aristotle and Montesquieu, tell us that elections lead to oligarchy, not to democracy. Instead of "rule by the people", we get rule by the oligarchic and criminal forces that are best able to manipulate the people. The elections are used to divide the people. Demagogues mislead people and keep people in the dark. Broken electoral promises foster cynicism. And when the political elite reveal their criminal nature, the blame is passed off onto the electorate. The result is that "we the people" lose whatever power we have. This is the exact opposite of democracy. Under the guise of "Democracy", we are made to forge our own chains. In the city-states of ancient Greece -- the original democracies -- leaders were chosen by sortition. That is, they were selected randomly from a pool of volunteers -- in the same way that we select jurors today, or focus group participants, or polling samples. This is the system that Montesquieu and Aristotle recommend to those who want real democracy. The Greek system, sometimes called "demarchy" or "aleatory democracy", worked for a thousand years and offers many advantages over elections. It offers proportional representation, while eliminating the party, the campaign and all of the financial dependency, demagogy, cynicism and disinformation that comes with the campaign. Where elections produce a club of millionaires and thieves, sortition produces a cross-section of the general public. With sortition, even honest people have a chance to serve in government. * It is not a new concept: People already welcome lotteries and strongly prefer clean chance-based institutions over dirty politics. * It results in proportional representation over time: Every group in society receives representation; no one is excluded. * It is extremely cheap: Even the poorest countries can afford it. * It can be introduced gradually, as a supplement to elections: A TV "reality show", for example, can introduce it by holding a lottery and sending the winner to Congress as an unofficial "Observer" or "Ombudsman". * Obvious problems can be addressed without much difficulty. E.g., qualifications for office can be established to exclude incompetents, and rapid recall procedures can be formalized to counter rogue incumbents. Look at what the "Cult of the Election" has produced -- R. Reagan, G.H.W. Bush, B. Clinton, G.W. Bush, B. Obama, H. Clinton. Are these really the best that America has to offer? I can't believe that they are. They represent the top 1% in assets and the bottom 1% in morals. This means that there is a 99% chance of producing better results with an aleatory system. The elections are inherently biased in favor of millionaires, liars, demagogues, and criminals. Is it responsible to use such a dysfunctional system to select the leaders of a nuclear power? Democracy is about empowering the people. The election circus was sold to us as a means to that end, when it is, in fact, a means for destroying the people and destroying democracy.